Celebrate agriculture! And show your pride in Anson County’s agricultural heritage by wearing a t-shirt that says so. 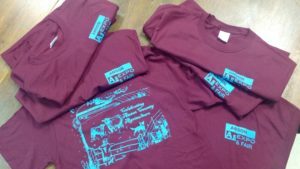 Celebrating Anson County Agriculture t-shirts have arrived at the Cooperative Extension Center and are now available. Shirts are available at the Extension Center at 501 McLaurin Street in Wadesboro. They can be purchased Monday through Friday from 8:30 until 12 noon and 1:00 until 5:00 p.m. while supplies last. Celebrate Anson County agriculture! T-shirt design by Aimee Colf, Agricultural Extension Agent.